By recovering nutrients from the treatment facility’s wastewater stream and converting them to continuous release fertilizer, Ostara’s technology helps R.M. Clayton WRC increase operational efficiencies through struvite avoidance - a cement-like scale in pipes caused by an excess of nutrients - and also serves to protect the local watershed from nutrient pollution. 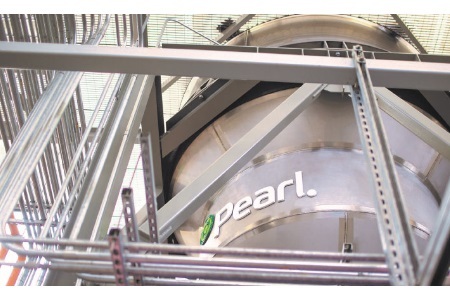 Ostara’s Pearl process can recover 80 percent or more of the phosphorus and up to 15 percent of the ammonia-nitrogen from wastewater streams before they accumulate as struvite in pipes and equipment. Ostara’s nutrient recovery system at the R.M. Clayton Water Reclamation Center will be a two Pearl 2K reactor system, housed in a new solar-roofed building, with an installed production capacity of around 900 tons of fertilizer per year. Through a long-term fertilizer purchase agreement, the City of Atlanta will receive revenue for every ton of fertilizer produced. One of the key differences with the fertilizer produced from Ostara’s process – marketed and sold as Crystal Green - is that it will further protect waterways through its unique “Root-Activated” mode-of-action, only releasing nutrients according to root demand and therefore significantly reducing leaching and runoff into surrounding waterways. Ostara helps protect precious water resources by changing the way cities around the world manage nutrients in wastewater streams. The company’s Pearl technology recovers phosphorus and nitrogen at municipal and industrial wastewater treatment plants and transforms them into a high-value, eco-friendly fertilizer, Crystal Green. The process greatly reduces nutrient management costs and helps plants meet increasingly stringent discharge limits while improving operating reliability. Crystal Green is the first continuous release granular fertilizer to provide Root-Activated phosphorus, nitrogen and magnesium (5-28-0 with 10%Mg), and is marketed through a global network of blenders and distributors to growers in the turf and agriculture sectors. Its unique Root-Activated mode of action improves crop yields, enhances turf performance and significantly reduces leaching and runoff, thus protecting local waterways from nutrient pollution. Ostara operates multiple facilities throughout North America and Europe. For more information, visit www.ostara.com and www.crystalgreen.com. SOURCE: Ostara Nutrient Recovery Technologies, Inc.